Lake House Living Room Progress! beautiful blank canvas. Now it boasts furniture and artwork! 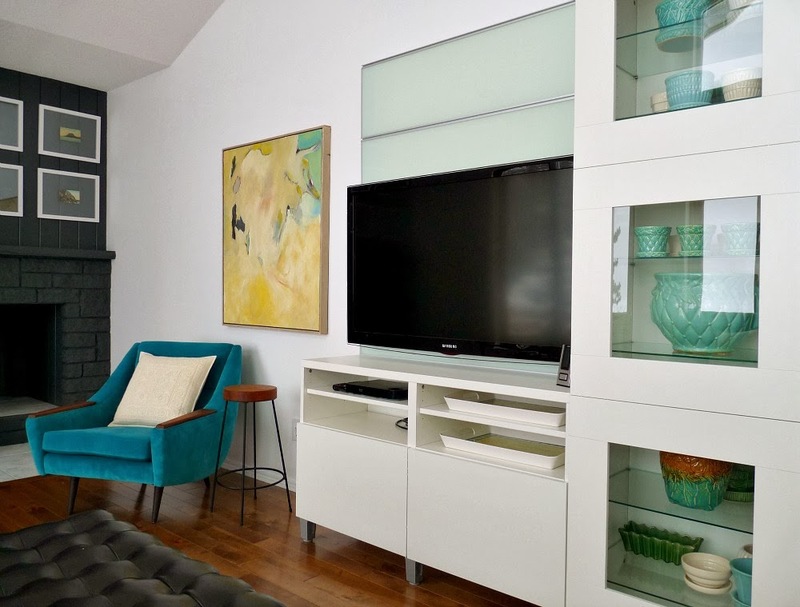 I’ve been keeping a secret: before we left Ottawa – I’m talking literally right before – I bought a mid-century sectional sofa. We actually picked it up with our U-Haul an hour before we began loading our stuff. I checked its measurements against our floor plan and it should fit nicely but I’d like the opportunity to actually haul it in here and see, before I invest time and money in having it professionally reupholstered. It’s in rough shape, but at its core it’s a beauty. I’ll show you photos soon but it’s currently in pieces, each perched on their side, in the garage. In the meantime, every piece here is from the townhouse. 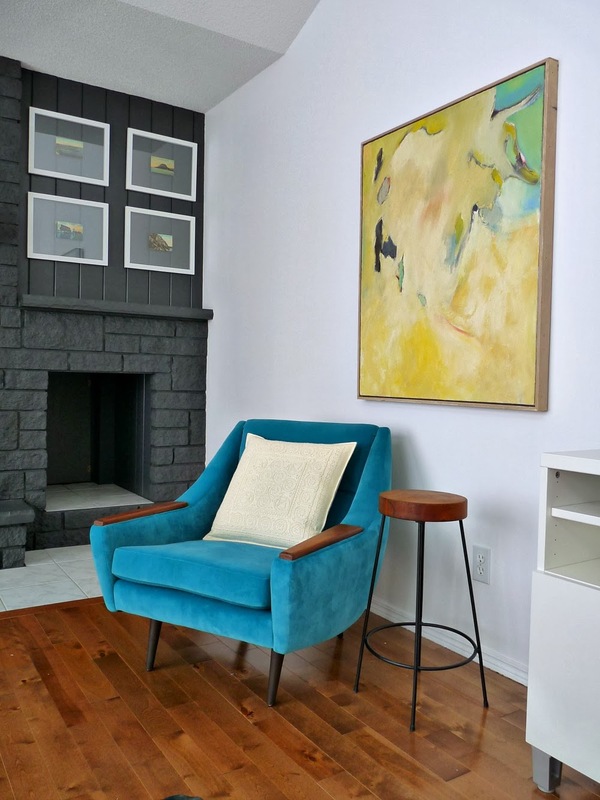 The teal velvet garbage chair, refusing to photograph true to life as always, is a welcome burst of colour below Hubby’s grandpa’s painting. 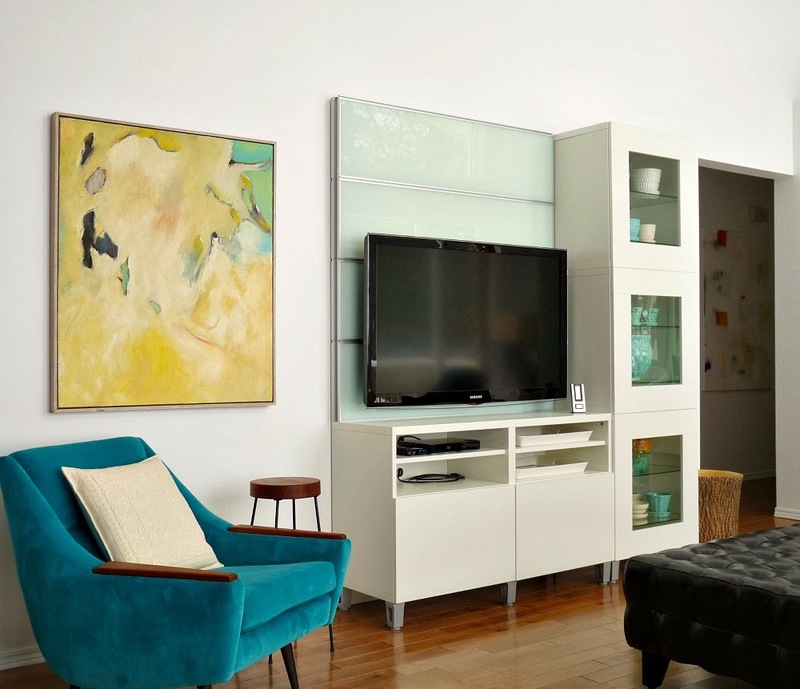 We’re still using our handy Ikea Besta wall unit for our television and my McCoy pottery collection. Our second-hand cream leather sofa made the 1500km journey unscathed, thanks to our plastic wrapping prowess. It’s looking a little bland, so I’m planning to rook my Mom into helping me sew some teal velvet cushions, and maybe even add a bold pattern. As planned, Hubby’s desk chair has been re-purposed as an occasional chair in the living room. 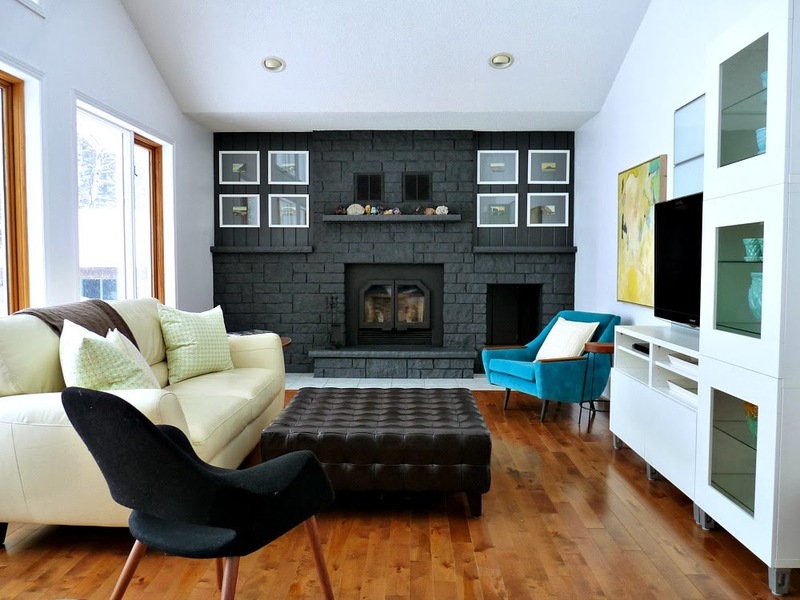 I still think black was a practical choice, but I can’t help but wish I’d picked something a little less “safe” because this living room, with it’s large windows and tons of natural light, can pull off bold colours with ease. Hubby & I hung the hundred year old Lake Superior postcards (they were hung in the stairwell in the townhouse) on either side of the fireplace. It’s incredibly lucky I found a couple more at the Ottawa Antique Show to round out my set so I had an even eight. 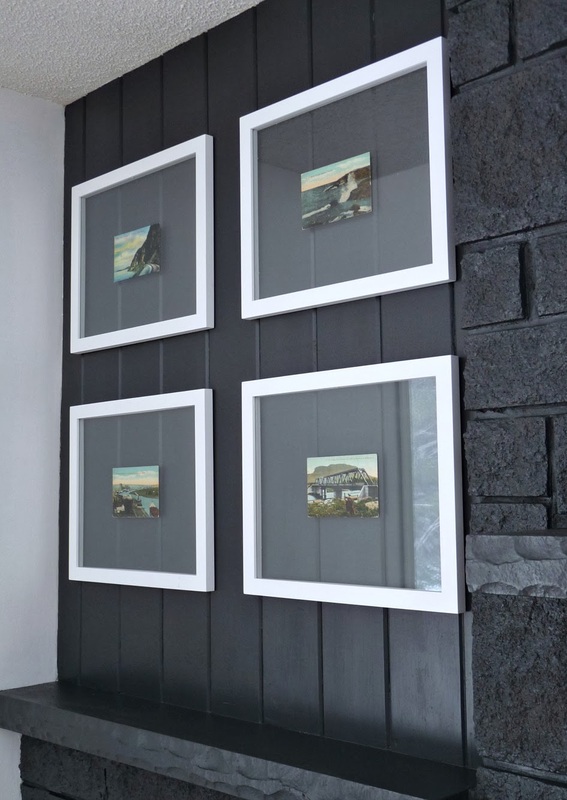 Placement was tricky because of the paneling behind – I wanted the panels spaced evenly behind the floating frames. It was do-able, but it dictated the spacing between the frames. 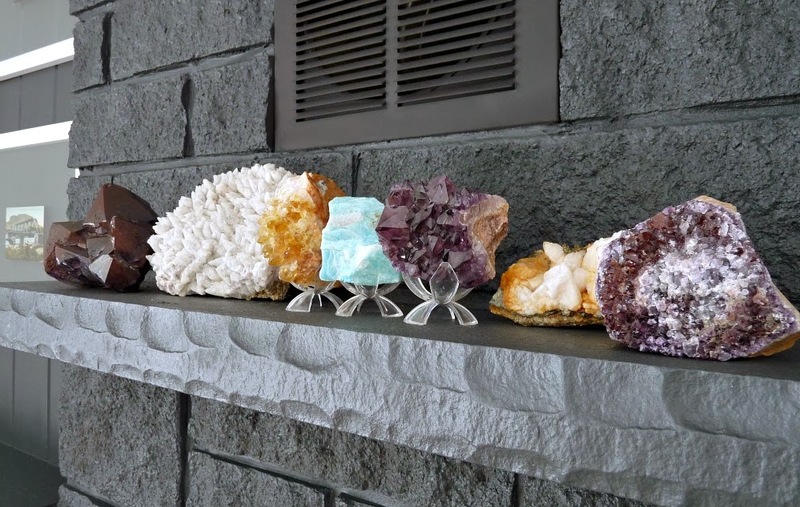 I acquired some large rocks from a family member and set them haphazardly on the fireplace mantle awhile ago, just so they were out of the way. In the unpacking process I added some rocks from my collection so they’d all be together while I figured out where to put them. They are still there and, with most of my decorative wares still packed, I’m happy for a little sparkle. We’ll call this “decorating the mantle” for now. The living room has come a long way, but it’s still got a long way to go. In the immediate future I’d love to add a much-needed lamp, more decor pieces, maybe a DIY sofa table, brighter cushions, plus a stylish DIY dog bed for Szuka. 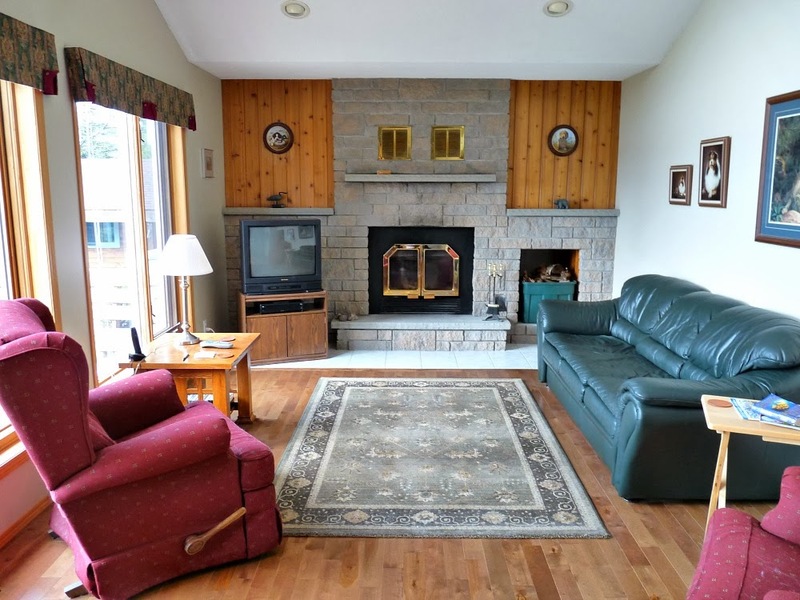 Then I’d love to makeover that vintage sectional, build a new ottoman, and, eventually, totally re-do the fireplace and rearrange the floor plans. Anything in the living room is subject to change, but for now it’s nice to have an area of the house that beckons us to put up our feet after a long day. Wow! Incredible. I always say, there is major power in paint! M.
Paint has definitely been my ally! My sister in law recently visited and she now wants to paint her fireplace too. I love the transformation! The room is very comfortable and full of light! 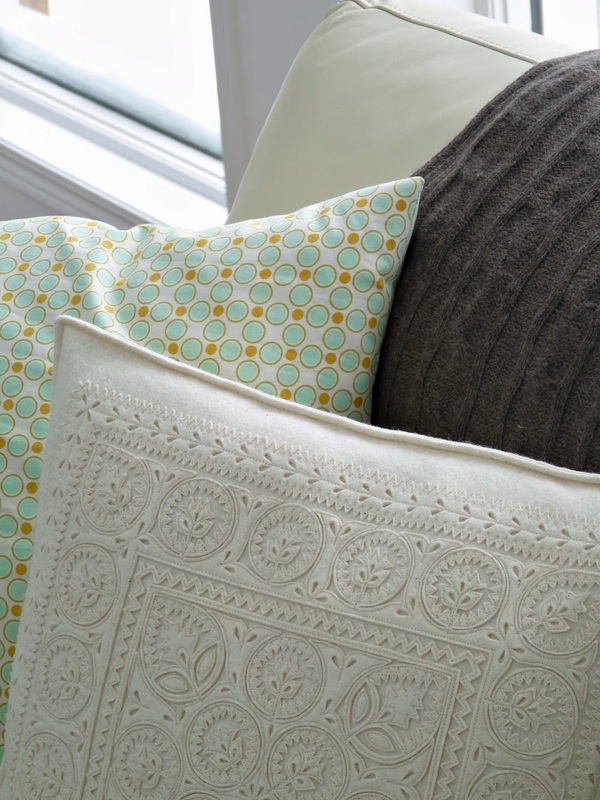 The chair being black is good… pops of color in pillows will work great! Maybe even a rug in color and one statement accessory piece on the ottoman? It will all come together! I'm glad you like the black chair. I think you're right: once the room is more "finished," it will be a nice balance. Pillows are definitely next on my list (much to Hubby's disappointment). HI Tanya, what a wonderful job you have done so far. It looks so clean and bright – something to keep in mind when we go on our house hunt in the spring; you can make anything look better with a lick of paint! It looks fantastic! I really like the placement of the postcards. Thanks! 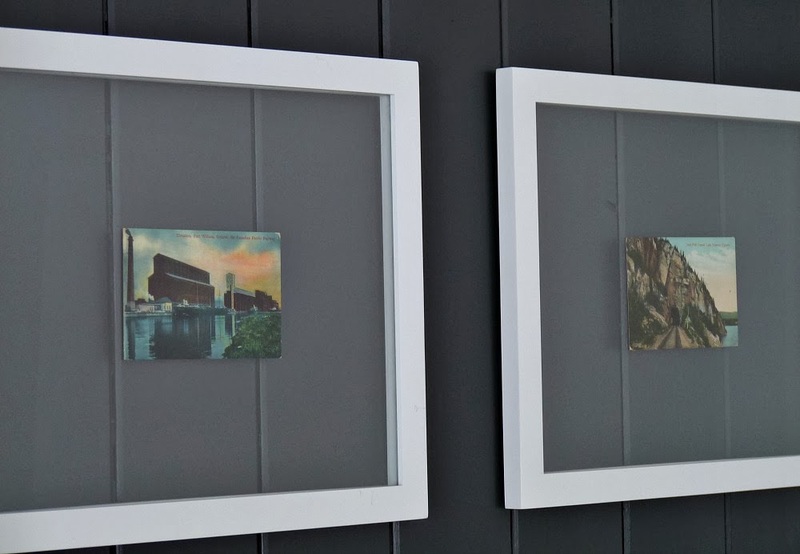 I'm so happy the postcards fit so well – I had my doubts because I didn't measure until right before we hung them! It's looking so you! 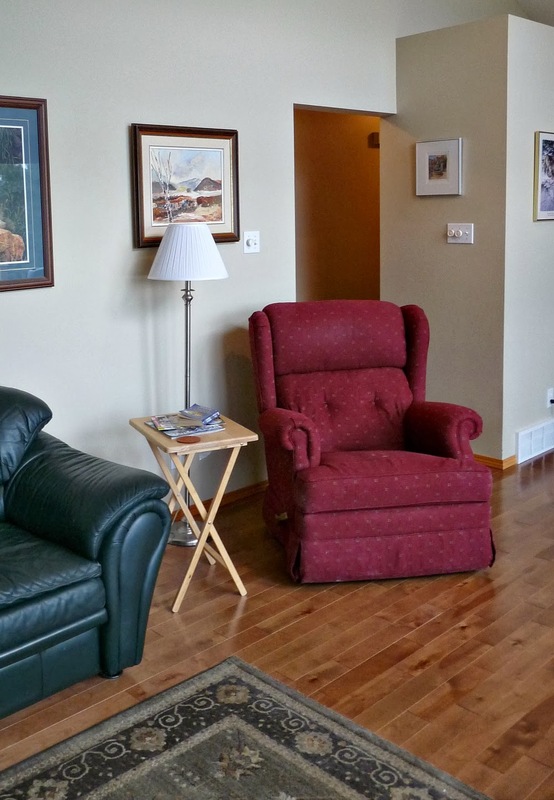 I like seeing the difference in furniture placement from old owners to now. It looks like they had their couch facing the windows to see both the view and the tv. It's also nice seeing how you can realy make a space your own with relatively minor cosmetic changes. 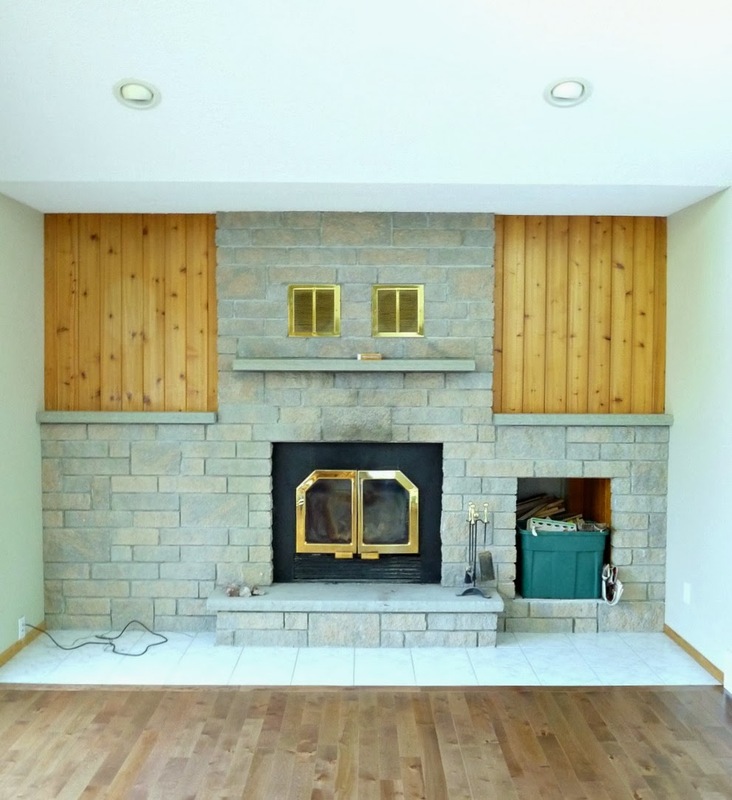 It's not like you knocked down walls, tiled fireplace or changed out the flooring. The art is really nice personal touch and I love your rocks! Thanks! 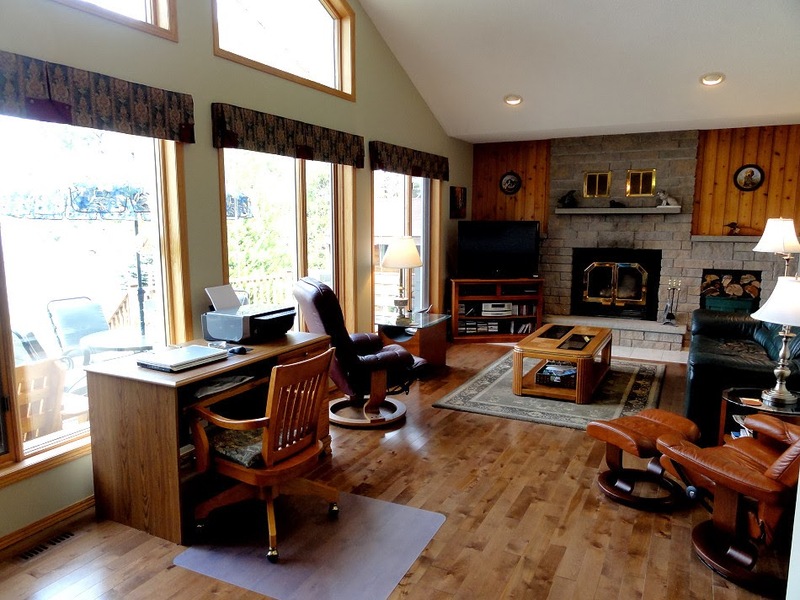 They did have their couch facing the lake (which I prefer), but then the television needs to be squashed in the corner. That's why I'd love to put the tv above the fireplace down the road, so we can swap the sofa (or new sectional!) to face the lake and the tv. For now, this works. We don't sit down until it's pitch black anyway, although we do enjoy the view during the day. It looks fantastic! Love that fireplace! Thanks!! I'm really happy I took the plunge and painted it. I can't even imagine working with it now. Yup, paint is amazing. It's incredible how quickly you've really made the space your own, and nice that your furniture fits the space so well. I see that you have lots of changes planned, but at least you can take your time with them and have a nice space to enjoy while you figure it all out! We are lucky things fit! I think it's hard to go wrong with a neutral sofa but we're lucky the scale isn't too wee or too giant. It's always interesting, though, to see things work so differently. The furniture has definitely shuffled a bit, in ways I didn't imagine when I first drew up the floor plan. But that's the fun part! 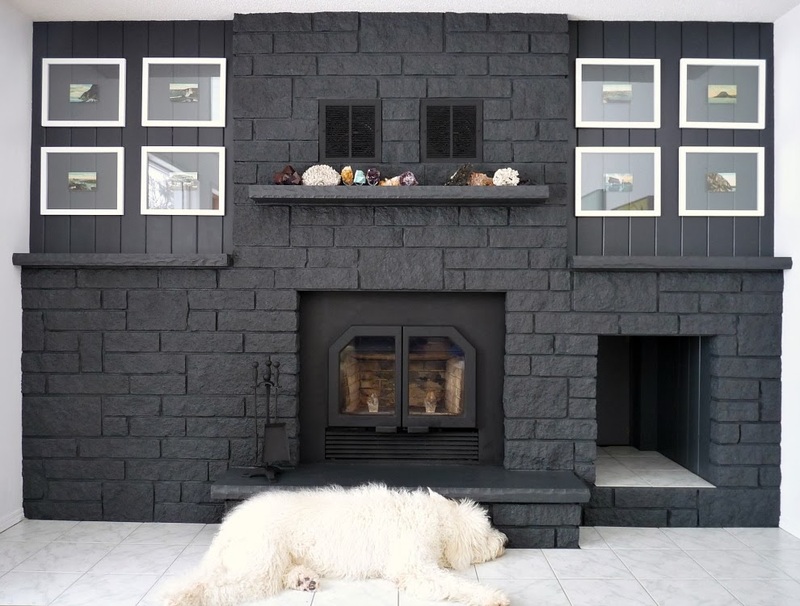 Love the fireplace and surround! Gorgeous! Thanks!! I'm happy I trusted my gut and got Hubby on board. It's exactly what I envisioned when I first saw photos of the house. Love it! Looks great Tanya. Such style! Awww, thanks! I'm lucky to have been gifted good art – it really helps make a space feel "styled" when it's really quite spartan. I tried so hard to get her to move, but she just loves the cool tile of the fireplace. Rubbing up against the teal chair is also her favorite thing to do these days, which terrifies me as she sports a perpetually wet beard from lots of snow-filled playtime. Luckily, it's holding up pretty well! This looks absolutely amazing! I wish you could come decorate my place! That's so sweet of you to say! You're always welcome to email me photos and I can share my two cents (dans.le.townhouse@gmail.com). I'm pretty predictable, though: white walls, some colourful art . . . Thanks!! I love the postcards too because they pick up on the colours in the painting. They were meant to be in the same room. I am so unbelievably happy that they fit!! I have a terrible eye for guessing sizes. You have totally transformed the living room. I bet the previous owners wouldn't even recognize the room. It looks great! Thanks! I am actually terrified of the former owners finding out. Our neighborhood is a little gossipy so I refuse to let anyone in. I won't have them reporting back! The former owner built this home and was SO proud of the oak everything, which I am systematically obliterating. I can definitely see his love for the house in some (not all) of the craftsmanship and I think he might be heart broken to see what I've done! He's an older gentleman, his heart might not take it! 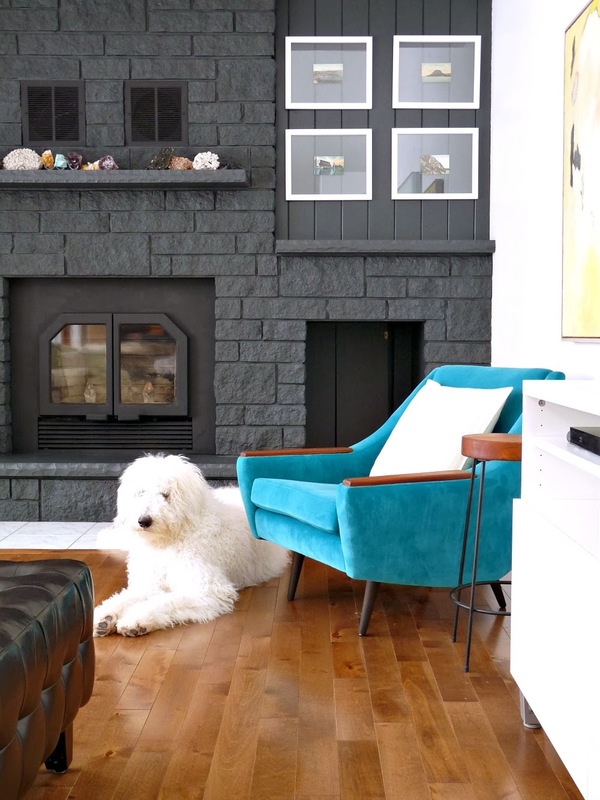 Absolutely love the dark painted fireplace wall. Beautiful! Thank you! It was a bold move for a white-wall-loving gal like me, but I am so happy with the change. The room has so much light, it almost needed something dark to keep from feeling totally washed out by my obsession with white walls. the first thing that caught my eye was the beautiful yellow painting. i was hoping you would say who the artist was so i could have one for my own, then you did… did grandpa paint it himself? perhaps grandpa has others??? joking. no, not really! it's stunning. and the room is coming together beautifully. can't wait to see the mc sofa in place. Hubby's grandpa is a professional artist and he has many more paintings for sale. Here is his website: bertweir.com. The yellow painting is from the 1980s and others from around that time have a similar feel. His most recent work is very bold, with rich saturated colours. He lives in the Parry Sound area and a studio tour can be arranged by appointment – the contact info is on his website. Hope this helps! Hi Sherry! You have this knack for making me blush. You're too kind! I love comments because I get a chance to connect with readers. I love answering questions and especially appreciate suggestions when I'm stuck on something. Sometimes I feel quite selfish because not all of my readers have a blog themselves so it's a one-way street and all about me. I'm so appreciative to have made new friends who can chat with me about design, so I make time to respond to all comments. Honestly, sometimes I miss some, especially if I'm approving comments on my phone. It's a nightmare typing on it! But I read each and every one. Thanks!! I've been so happy with how simple it's been to modernize the space so far. It was built in the late 1990s, but really had an 80s feel to it. I wish I could paint away the beige and pink vinyl floor as easily, lol. You're right, that black chair just doesn't work… you should send it to me ; ) That chair is exactly what I've been looking for our house. We have an awkward pass-thru 'dining room' that has entry from living room and hall and connects to the stairs down to the basement… oh, and a set of patio doors. How your supposed to fit a dining table is a mystery. I want to convert the adjacent living room to the dining room and use this space for a couple of small scale chairs (enter your stylish black chair) and an accent table for sitting with coffee. We have a living room downstairs, so we don't need one up also- just a comfy place to sit and chat off the kitchen. Okay, my apologies for the story behind my love for your chair….. WOW! I love your living room! I knew it would be spectacular once you filled it with your beautiful things. Love the teal chair and while it may not photograph true to it's colour, you can see how well it plays with the painting and the McCoy pottery. Same with the postcards and the mantle rocks- the colours work beautifully from the teals & blue to the amber and yellows. Nicely done… as expected. Thanks, I'll take all the luck I can get. At least our new area seems to have more vintage shops, perhaps I will find just the thing to fit the space. I think to get a nice, quality piece, it's going be pricey but it will help if I can bring it home myself. Thanks for the website, I will check it out but I expect that shipping would be a barrier (at least I can dream). C'mon thrifting luck! You could put the word out to the vintage shop owners, who can keep an eye out for you. 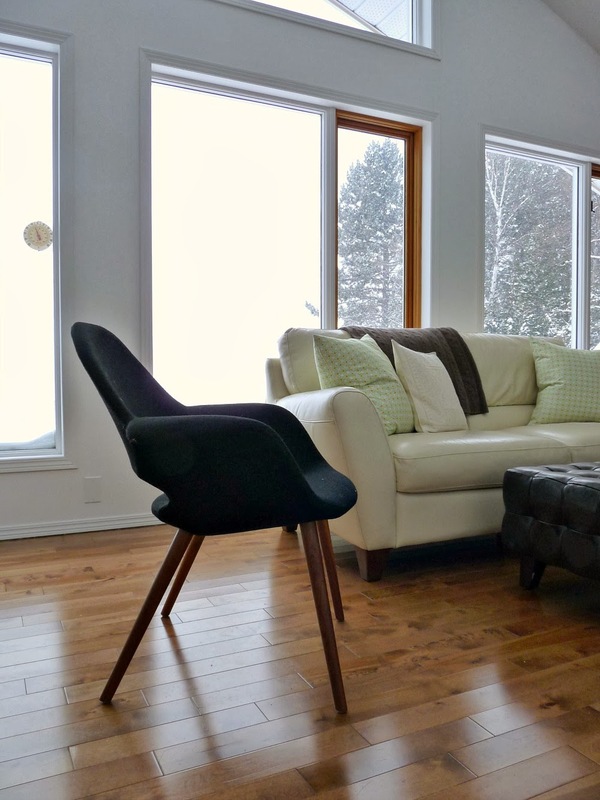 If you end up spending some cash, know that this style of chair is really versatile. It can always be tucked in a bedroom, by an entryway, in an office – even as dining chairs with the right height table. Shipping might be steep, although sometimes they have freebie shipping and sales – I think it pays to register for their newsletter.Happy hunting! Great redo. I saw it on Apartment Therapy. Did you buy the ottoman or build it? If you bought it, which store? If you built it, will you be writing instructions? I've been looking for a large tufted ottoman. Thank you. Thank you! I bought the ottoman about six years ago from the Brick. It's truly terrible quality and coming apart at the seams. I bought the extended warranty for it but apparently this "Leather Cocktail Table," (which the tag said) means "Leather-look" so the warranty didn't cover it. I'm planning to build my own at some point, but in the meantime I rounded up a few awhile back (including some tutorials):http://dans-le-townhouse.blogspot.ca/2012/03/reader-q-tufted-ottomans.htmlI've also seen some nice ones on Overstock for not a lot of money. Hope this helps! Great improvement. & Where'd you get that charming dog? He or she is a work of art. Speaking of art, I love the framed arrangement flanking the chimney. Thank you! She (Szuka) is a Hungarian Komondor, a sheep-guarding breed. It's the kind of breed that eventually grows big, messy dreadlocks. She is large (not full grown yet at 80lbs) but is relatively low energy. She likes to play, but only has energy for short bursts of running around. Then she needs a nap. She prefers to keep watch. We're really, really happy with her. We wanted a big dog but not a high energy working dog that wouldn't be content to sit around on the deck with us. There is a couple near Toronto who have Komondors of their own. They aren't really breeders, they just love their own dogs and when they had a litter this past summer we got Szuka! Such a lovely post! It is a helpful posting and give us an idea to make over the room. Thanks!! The room definitely looks much different than how it looked before, with very few cosmetic changes (but, of course, our own furniture). 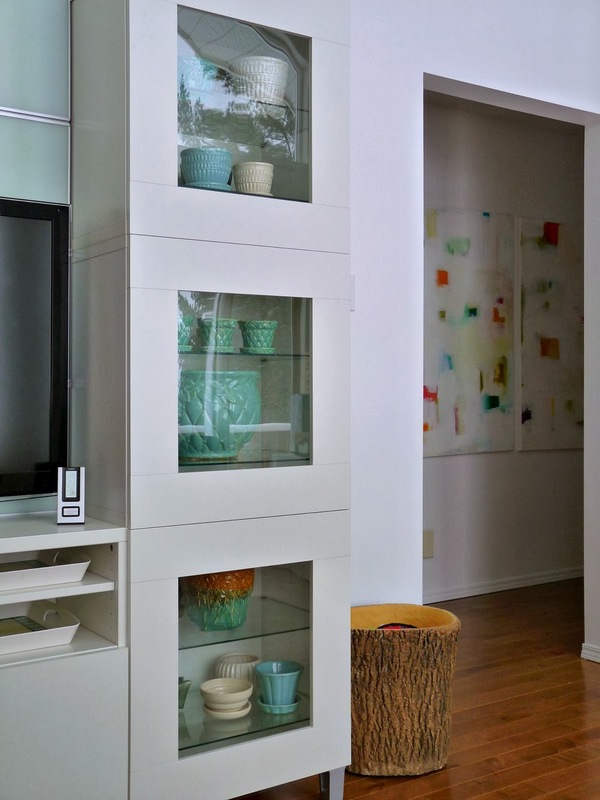 It can be tricky to see past people's decor when house shopping. Hopefully this helps someone see that it can be easy and inexpensive to modernize dated eyesores.